External Quality Assessment (EQA) programs are accepted around the world as invaluable tools used by laboratories to periodically assess their analytical performance and achieve added confidence in reporting their patient test results. Results are objectively compared to other laboratories using the same methodologies, instruments and reagents. When used in conjunction with daily QC, these external programs will assist laboratories in improving analytical quality, inter-laboratory agreement, identify potential equipment or reagent failures, and identify any training deficiencies. Online/ Mobile - EQAS Online is a web-based reporting option that allows labs to provide updates to contact information, program and test configurations, and enter data automatically to the EQAS database through QCNet.com. QCNet before accessing the mobile application. EQAS User Guide - a comprehensive overview of Bio-Rad's EQAS programs. Product Inserts - lot/cycle specific instructions for use for each program. Method Summary Reports - summary of instrument/ method performance among participating laboratories provided at the end of each cycle. EQAS/Unity Bulletins - login required. Online/ Mobile - User Guide, set up, and data submission instructions for the EQAS web-based reporting system. Report Interpretation - Review of key elements and interpretation of the Quantitative EQAS reports (Sample, End-of-Cyle, Method Summary and Subgroup). EQAS Sample Report Review Chart - This tool offers easy to follow steps that will help you with reviewing your EQAS Sample Report and interpreting flagged results. EQAS Troubleshooting Checklist - This checklist can be used with the EQAS Sample Review Chart to help troubleshoot flagged results. For advice, information, technical support, or assistance with troubleshooting your EQAS results, please refer to below information or contact your local Bio-Rad office or representative. EQAS Blood Gas Program is a monthly external quality assessment program for the reporting of routine blood gas, electrolytes, glucose, lactate and magnesium by blood gas, ion selection electrode (ISE) and biosensor instrumentation. EQAS Clinical Chemistry (Monthly) Program is an external quality assessment program for general chemistries and thyroids. Samples are tested and data submitted only once-per-month. Monthly reports provide informative statistical analyses and valuable peer group comparisons. Reference Method Values available for parameters in green. 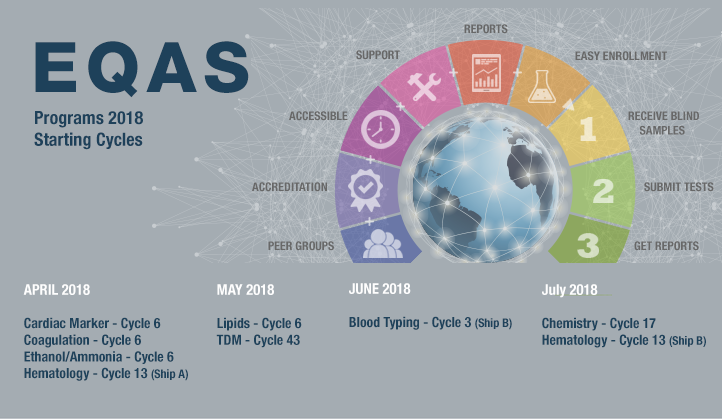 EQAS Cardiac Markers Program is a monthly external quality assessment program for assessing cardiac health including D-dimer, that are tested in clinical labs and near patient/POC settings worldwide. EQAS Coagulation Program is an external quality assessment program designed for the quantitative measure of basic coagulation parameters, including Protein C and Protein S Activity. Twelve plasma samples are tested over the course of an annual cycle and results submitted once per month. EQAS Ethanol/Ammonia Program is an international, monthly, external quality assessment program containing levels of ethanol and ammonia in serum that span normal to abnormal (or toxic) ranges. EQAS Lipids Program is a monthly external quality assessment program containing serum analytes for a full range of lipid profile. EQAS Serum Protein Programs is an external quality assessment program for testing specific serum proteins, including kappa and lambda light chains. Samples are tested and results submitted each month. Regular reports provide informative statistical analyses and valuable peer group comparisons. EQAS Therapeutic Drug Monitoring Program is an external quality assessment program for monitoring up to 21 analytes. Participants submit results each month and receive regular reports with informative statistical analyses and valuable peer group comparisons. EQAS Tumor Marker Program is an international external quality assessment program offering key tumor markers, including the important myeloma maker, S-100 Protein. Twelve samples are tested over the course of an annual cycle and results submitted once per month. EQAS Urine Chemistry Program is a comprehensive matrix appropriate program offering up to 24 of the most commonly tested basic and specialty urine chemistry analytes. Samples are tested once-per-month. Laboratories will receive informative monthly end-of-cycle reports providing statistical analyses and valuable peer group comparisons. As an international EQA provider, Bio-Rad determines the acceptable performance of a laboratory participating in their EQAS® Program. Performance of each reported test result is based on a statistical comparison to a robust mean and standard deviation. The use of robust statistics based on ISO 13528 and assessment against a consensus group mean are widely accepted practices used in many ISO 17043 accredited programs. Globally, a number of regulatory bodies and scientific organizations have independently determined acceptable performance criteria(quality specifications)for a number of key laboratory tests.These are based on Biological Variation, regulatory or scientific recommendations. In the new EQAS® Quality Specification Report, a laboratory may assess their EQA test performance based on the quality specification of their choice. Performance in this report is based on the percent deviation of the reported test result. This value-added report is only available through EQAS® Online. A laboratory may generate their EQAS® Quality Specification Report for each sample reported on. It does not replace the EQAS® Sample Report. Bio-Rad will initially offer Biological Variation (BV) limits (minimal, desirable and optimal), CLIA proficiency limits, RiliBÄK, RCPA, IQMH and GOST criteria for acceptable analytical performance in the EQAS® Quality Specification Report. Additional performance criteria (quality specifications) and guidelines will follow. EQAS Hematology Program is an international external assessment program for satisfying your basic hematology testing needs. Samples are provided in the convenience of liquid form in pierceable primary tubes and are to be tested on a monthly frequency. Valuable peer group and statistical comparisons are provided for each sample. EQAS HIV/Hepatitis Program is suitable for serological tests used to detect key HIV and Hepatitis viral antibodies and antigens. 1Aspects of the program are subcontracted from an approved supplier..